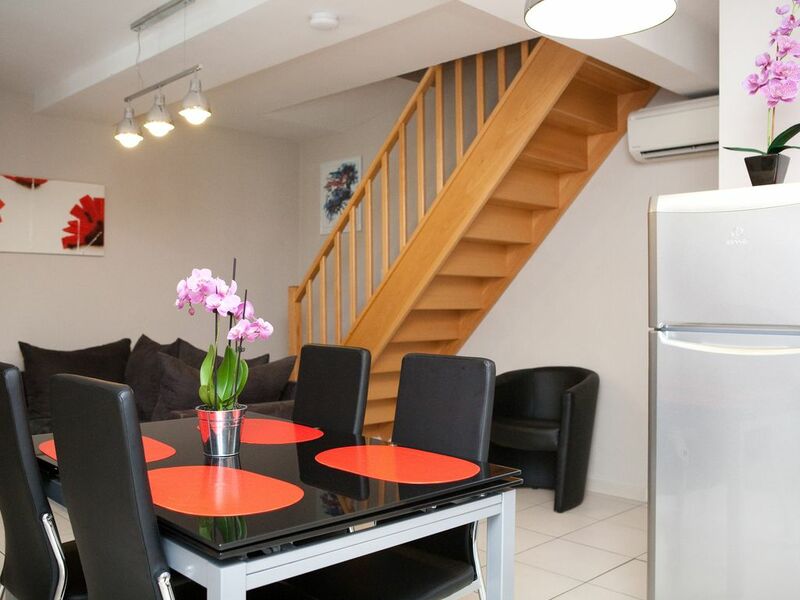 Town house renovated on 2 levels, 700 meters from the cathedral and the Toulouse Lautrec museum. Free covered parking public. Flea market every Saturday morning. Shops nearby. The accommodation comprises ground floor: living room (30 m2) with kitchen (microwave, ceramic hob, fridge-freezer, dishwasher, toaster), washing machine, toilet, living room (flat screen TV, DVD). Wifi. Floor: 2 bedrooms (9 and 10 m2) each with 1 bed 140, bathroom (hair dryer), WC. Bed linen, linen and towels. Air conditioning. Passámos quatro dias maravilhosos,a visitar esta região. Albi e todas as vilas que visitámos,eram muito bonitas.A casa fica muito bem situada e tem excelentes comodidades.O estacionamento,mesmo em frente,estava sempre disponível e gratuito.Os anfitriões foram muito simpáticos e prestáveis.Um pequeno reparo:poderia haver melhor informação no site,àcerca do fornecimento de lençóis e toalhas,e do seu custo.Voltaremos certamente ! Très belle location. Equipements de qualité. Grand parking gratuit devant la maison. 5 minutes à pied de la cité épiscopale et du centre ville. Super location, grand confort, très bien équipée. 700 meters walk from the Episcopal City of Albi, charming town house completely renovated on 2 levels. Un chèque de caution 50 % de la location vous sera demandé à votre arrivée.